One million coloured coins will be released next month to mark the centenary of the Anzac landings on the Gallipoli Peninsula. 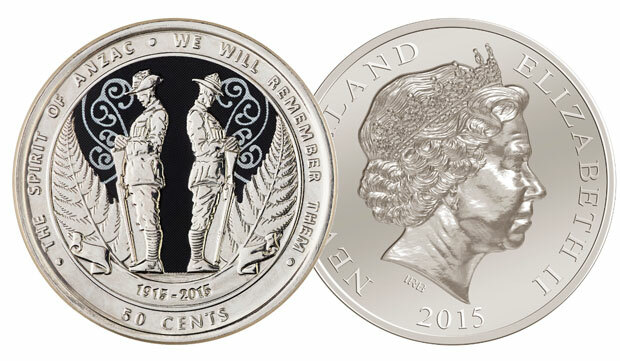 The special 50c features New Zealand and Australian soldiers standing back to back with their heads bowed in remembrance on one side and Queen Elizabeth II on the other. It is New Zealand’s first coloured coin and was unveiled today at Government House in Wellington by the Governor-General Sir Jerry Mateparae and Reserve Bank governor Graeme Wheeler. Sir Jerry said the issuing of the coin was a tangible way to pay tribute to the “comradeship, a steadfastness and a promise” that existed between New Zealand and Australia.